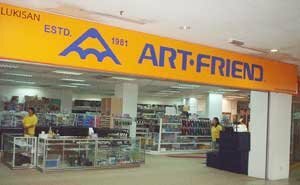 Malaysian Watercolours: Where can you get good watercolour materials? IF you have been browsing the local art supplies market, I am sure you have narrowed down to two cities where you can get good watercolours stuff. One is Penang and another, Kuala Lumpur. However, Kuala Lumpur, unlike Penang, has been traditionally disadvantaged by the limited by the number of good art suppliers. Recently, however, I was pleasantly surprised by the emergence of another art shop in the heart of Kuala Lumpur. Art Friend, located at the UE3 complex along Jalan Loke Yew, towards Cheras side, is the latest addition to the local art supply scene. 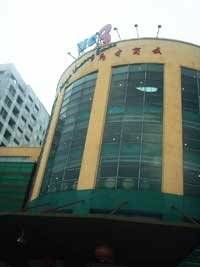 I have been to this place and checked out some of the prices of material, from paper to watercolours. And I think they are reasonably priced here. If you are a fan of Daler-Rowney, I think you will be pleasantly surprised by the range available here, especially where watercolours are concerned. Apart from the wide range of pan-colours, it also sells tubes - and the price is pretty competitive at below RM7.00 for the student colours. Despite the rise in other prices, I am glad to say, this shop has decided to keep prices low for artists who are already hard hit by the price hikes in their lives. Art Friend too has other items like special water buckets (from RM5.00 to RM15.00), box-easels from RM60 above, papers of various poundage and prices, and other watercolour implements. And what makes it unique, Art Friend also sells other art stuff, from painting to, well, wall painting. Crafts implements are also sold here. There are other art-related materials sold here, from wall stencils to fashion beads. You will be amazed. And the good thing is, the prices are kept low. And if there is one artist's friend, then it is Art Friend - and hopefully it stays that way. Would you know what kind of watercolour is used in 'name painting'? Pictorial calligraphy artists use it and it APPEARS to be a thick watercolour or ink. Hope you can help.